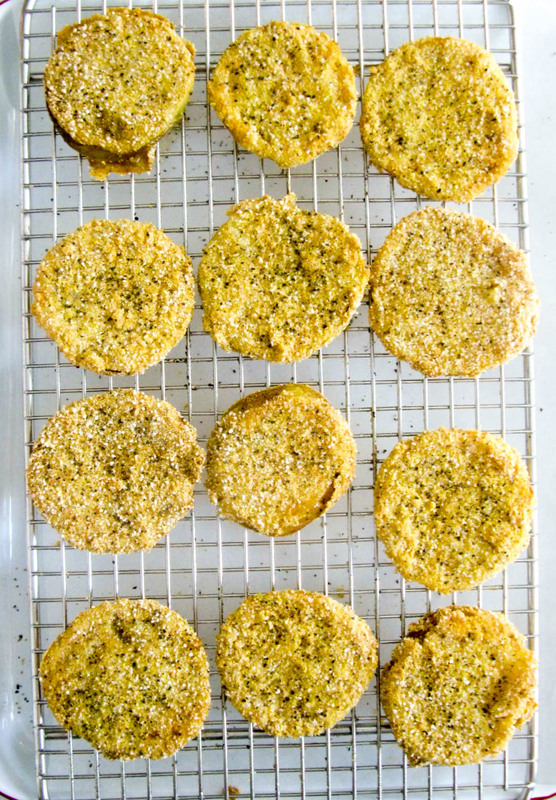 Southern Fried Green Tomatoes, crispy on the outside tender and meaty on the inside, yielding a tangy sweet flavor like no other. 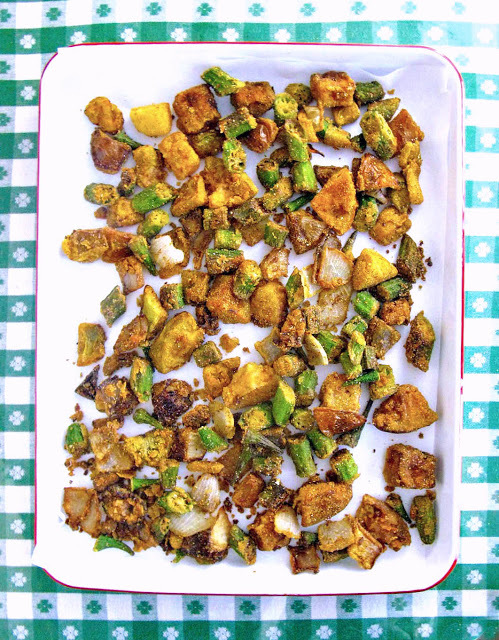 Serve them stacked as a delightful appetizer or an elegant side dish. It is time for Fried Green Tomatoes! Summer is synonymous with Fried Green Tomatoes in my neck of the woods. Right now we are in the middle of fresh garden vegetables appearing in Farmer's Markets and some local grocery stores. I must say the first thing I check for in my local grocery is if they have any green tomatoes. Last year they kept coming in the store until late September here in Texas. I only buy a few green tomatoes at a time to make sure that they are nice and firm when I get ready to fry them. I like to pick out firm green tomatoes and some that are a little pink. They are the ones that are just starting to show some ripeness, sweeter yet still tangy in taste too. It is just a preference. Are green tomatoes unripe tomatoes or a specific variety of tomatoes? Many people that are not from the south wonder about this. Fried Green Tomatoes are made with unripe tomatoes and only unripe green tomatoes. There is an heirloom green tomato variety that is used only for salads and a delicious tomato pie. Heirloom green tomatoes actually are as ripe and juicy as a traditional red tomato, they are what I call a fancy tomato. Heirloom tomatoes make the most gorgeous tomato tart or tomato pie. Building the superb Fried Green Tomato begins with layering the flavors. Start by laying the sliced green tomatoes on a paper towel lined sheet pan and pat dry. The next layer of flavor is buttermilk. I am intrigued why you pat them dry only to dip them in buttermilk. 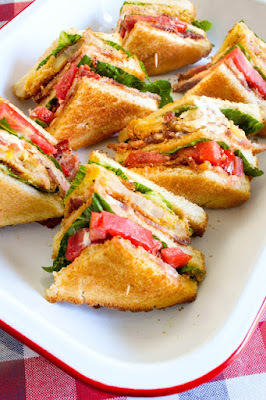 It is my understanding the juices from the tomatoes do not adhere to the breading like buttermilk does. It is the same science behind pat drying chicken or steak before dipping it in buttermilk before breading. I am still not understanding the science behind this, one day maybe, I will get back with you on the answer, for now, it is a mystery. While the green tomatoes are resting, make the next layer of flavor, the breading. I have always only used a white self rising cornmeal mix for the breading, but in recent years I have developed a breading that is superb in flavor and texture. I have started adding a little fine ground grits to the self rising cornmeal mix. And there you have it, the secret to superb Fried Green Tomatoes. You may or may not consider what the green tomatoes are fried in as a flavor layer as I do. If you are familiar with my recipes, you will know, I fry everything with shortening, such as Crisco. The hot Crisco shortening drains off of the food quicker and better, creating a crispy texture. Shortening has a high smoke point. Whereas vegetable oils seem to linger on the food, leaving an oily taste. I usually add a tablespoon or two of bacon grease along with shortening when frying the green tomatoes. Now that is a flavorful combination. Bacon grease makes everything taste better. It is important to fry the green tomatoes in a shallow measure of hot shortening. Tomatoes do not float like frying squash. If there is too much hot melted shortening, the tomatoes will sink to the bottom and grab too much grease and be soggy when removed from the hot oil. 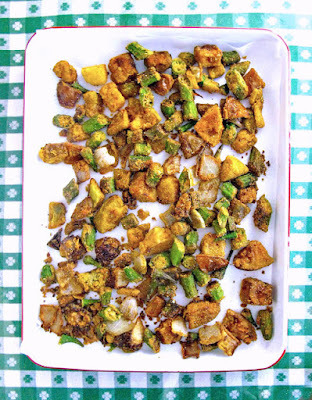 Make sure the melted shortening does not cover the breaded green tomatoes when frying. The Fried Green Tomatoes are not finished until the last layer of flavor is applied. And that is a generous sprinkle of salt and pepper while still hot. 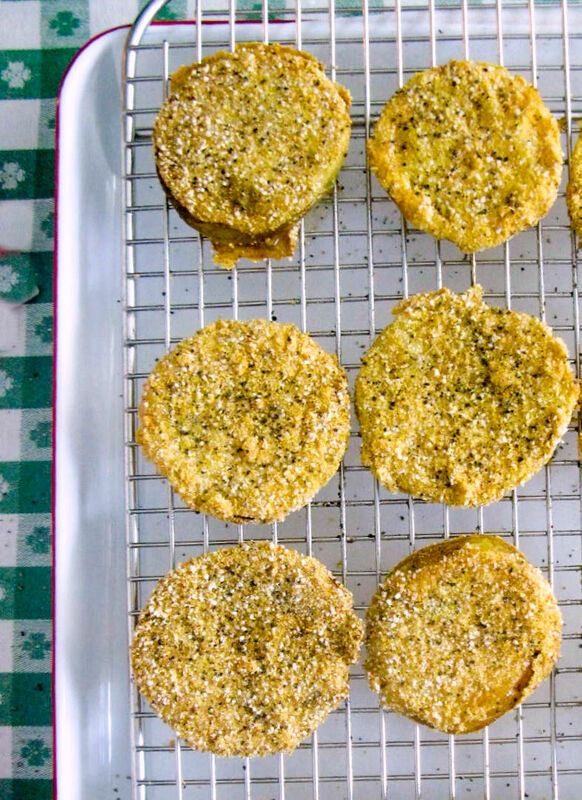 We love these Fried Green Tomatoes. The recipe is the most flavorful one you will ever make. As you can see, the ingredients are straightforward, and the method is uncomplicated to build the superb Fried Green Tomatoes. Enjoy! Crispy on the outside tender and meaty on the inside, yielding a tangy sweet flavor like no other. Serve them stacked as a delightful appetizer or an elegant side dish. Lay tomato slices on a paper towel lined sheet pan and pat dry. Pour buttermilk in a shallow dish; set aside. In a shallow dish, combine the self rising white cornmeal and fine grind grits. Heat the shortening and bacon grease in a cast iron skillet or a large heavy bottom skillet until hot but not smoking. While the shortening and bacon grease is heating, dip green tomato slices in the buttermilk, coating them well. 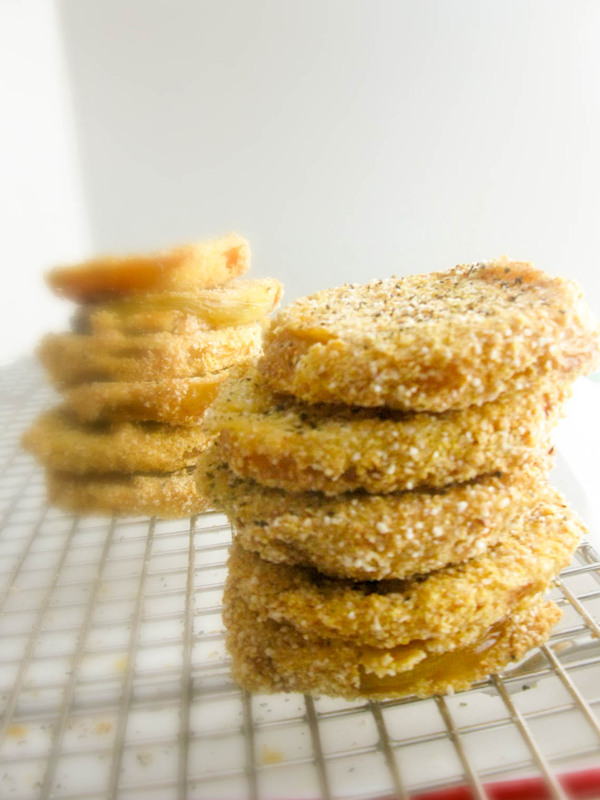 Immediately transfer buttermilk dipped green tomatoes into the self rising cornmeal mixture, coating each side well. Lay coated green tomato slices on a sheet pan until all have been dipped in the buttermilk and coated in the self rising cornmeal mixture. 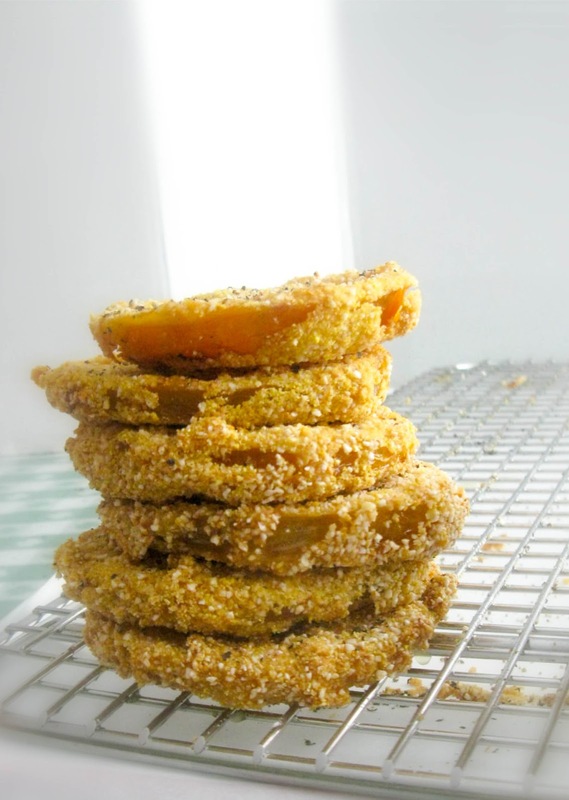 Fry three or four dipped green tomato slices at a time in the hot shortening at a time. Fry until golden brown, approximately 3-4 minutes, and using tongs turn over to fry the other side until golden brown, approximately 2-3 minutes. Transfer to a platter lined with paper towels. Immediately sprinkle with salt and pepper while still hot. Wait 10 minutes before serving. These kind of recipes remind me so much of my grandma. She was raised in the south and made the best food ever!